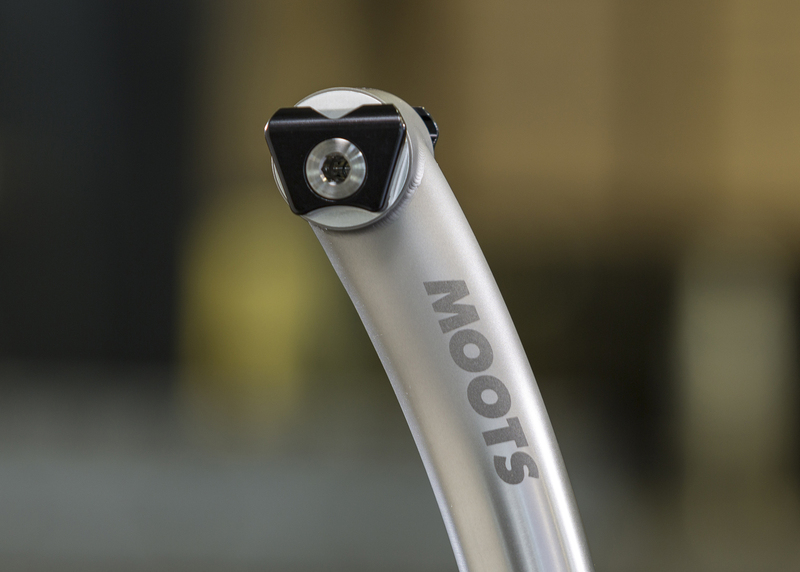 This stem was brought to life with the same design principals as the RSL: build it rock solid and durable with Moots quality and craftsmanship. 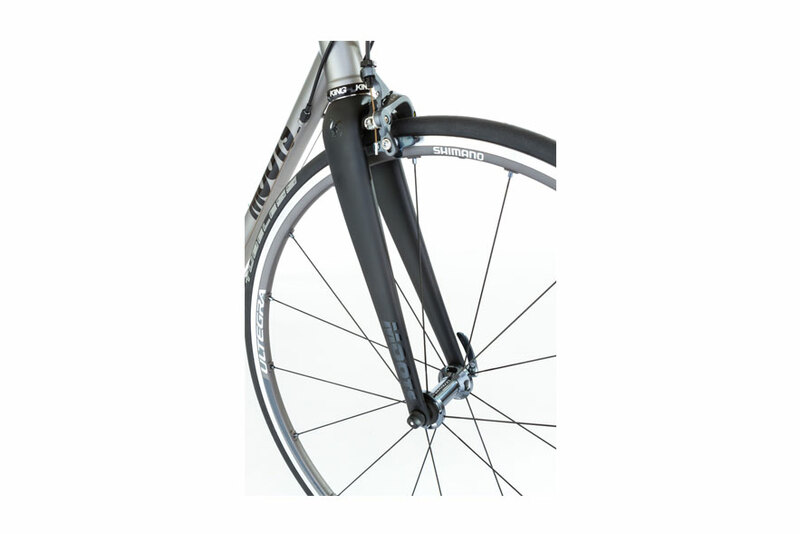 All said and done, we created a 120-gram stem that is as durable as it is beautiful. 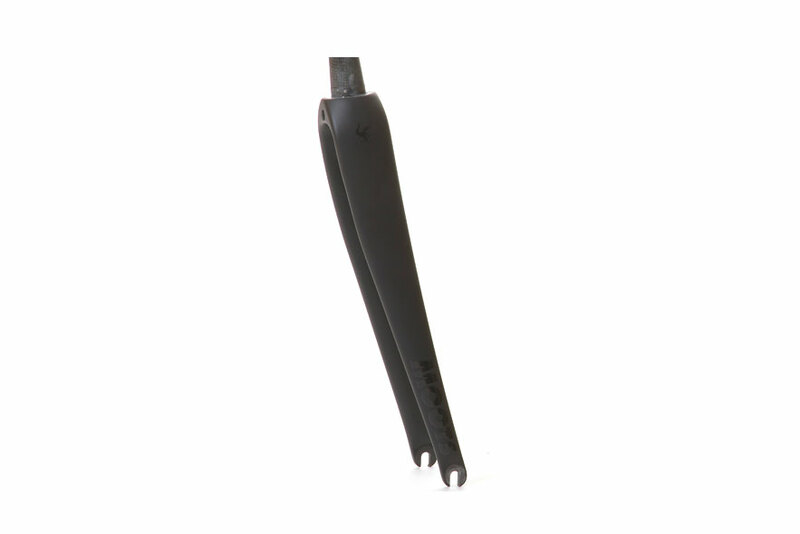 This stem surpassed all industry standards in destructive testing and provides a ride that is as sure as our frames. 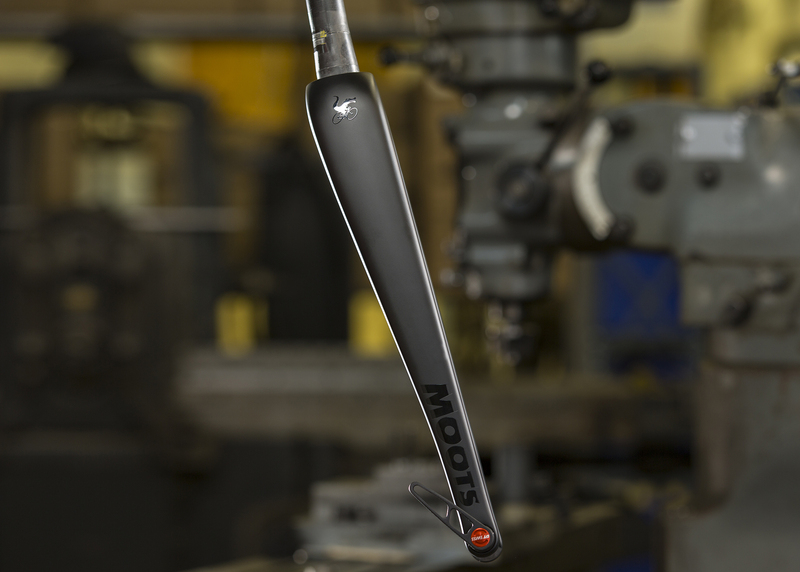 Windowed steerer clamp, double-band faceplate and 6/4 titanium hardware complete a package that oozes pure style. 10 stock sizes with custom always available. 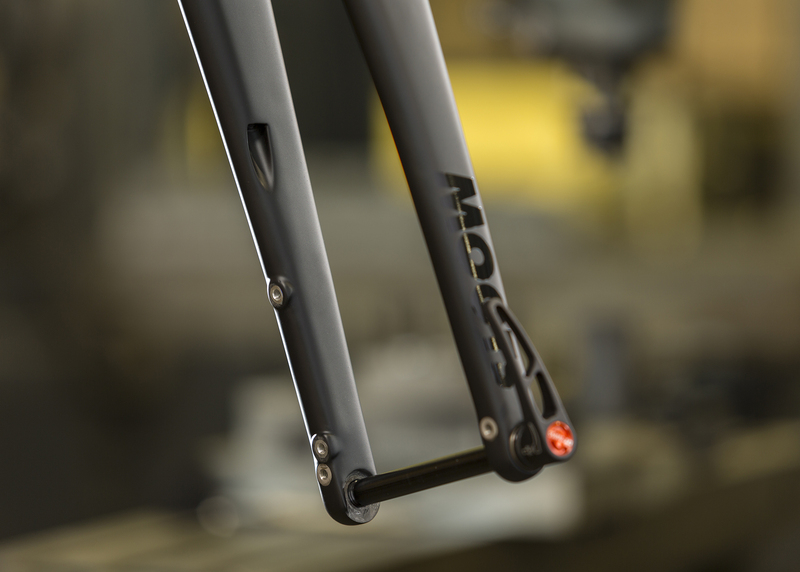 One stem optimized for all of your mountain, cross, and road needs. Bi-ovalized oversized extension for lateral rigidity, 4 bolt handlebar clamp sized for 31.8 bars, lightweight machined faceplate, and welds just as beautiful and precise as those on our frames. Available in 90,100,110 & 120 lengths with -6, 0, & +6 angles as well as custom lengths and angles. 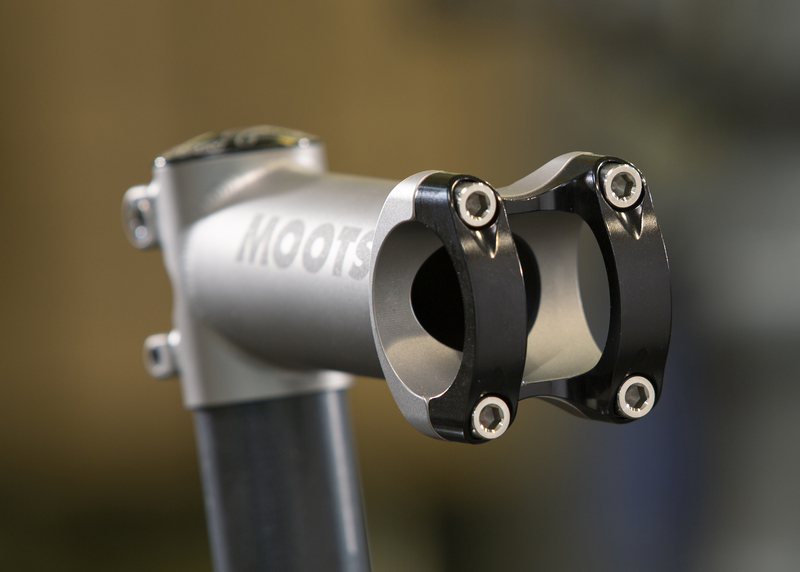 Moots in-house designed, executed in full carbon fiber to exacting tolerances. 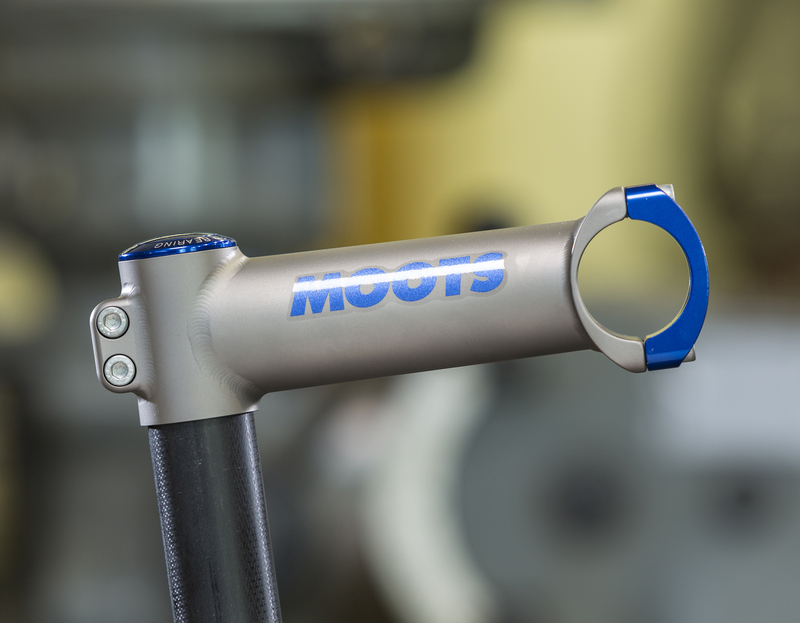 The Moots gravel/cx fork incorporates industry leading standards into one capable piece. 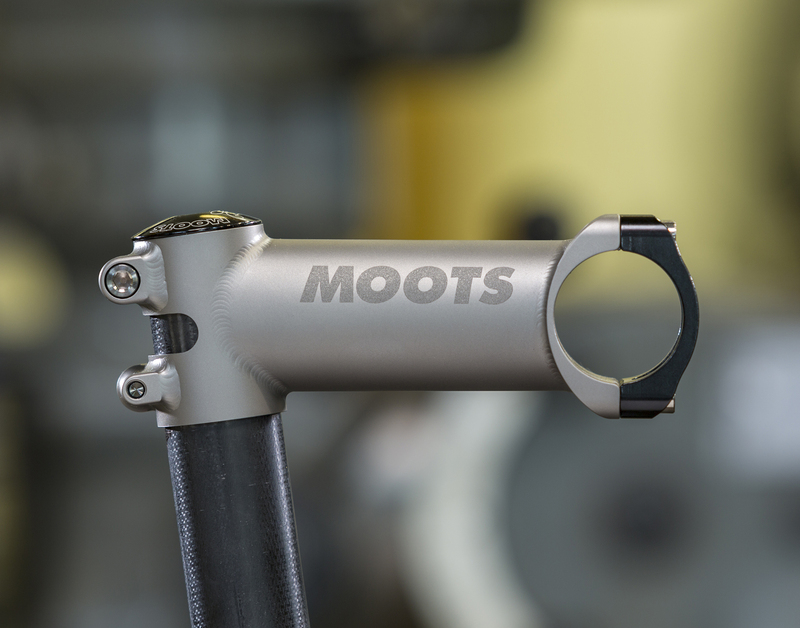 A tapered 1.5 inch to 1.125 steerer tube for predictable handling and unsurpassed stiffness taking riding input into line holding precision. 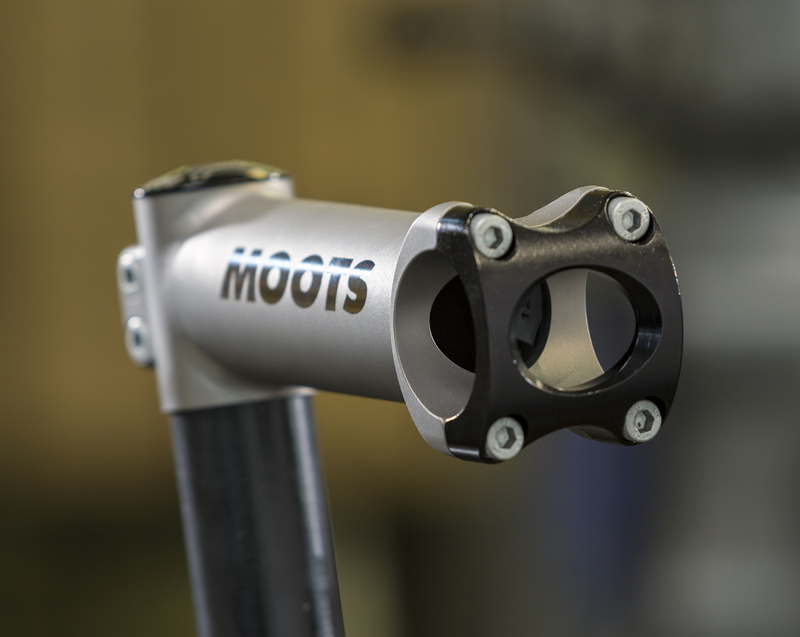 The Moots fork has massive clearance and will hold up to a 45mm tire (700c) 2.0 if running 650b. Measuring 395mm axle to crown and 47mm in offset, this fork hits the sweet spot for handling on all of our gravel & cx frames. Flat mount disc brake mount, 12 x 100 thru axle for precise hub and rotor alignment. Internal hose routing for clean aesthetics.  We have also incorporated hidden fender mounting points (hardware included) so you can ride in comfort no matter the weather. Max rotor size: 160mm Fork weight: 475 grams with axle. 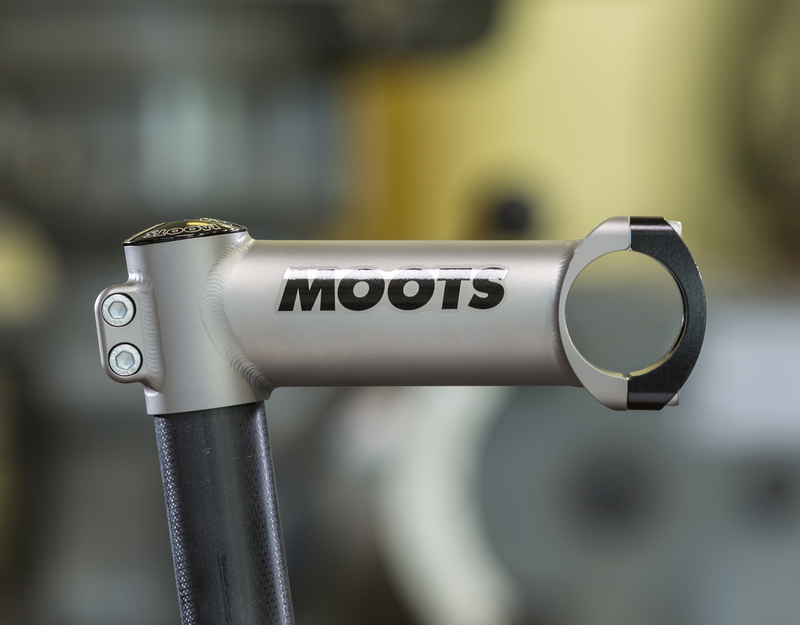 The Moots full carbon disc road fork is designed in-house and built to handle the stresses of modern day road bikes and the forces disc brakes place on the fork. 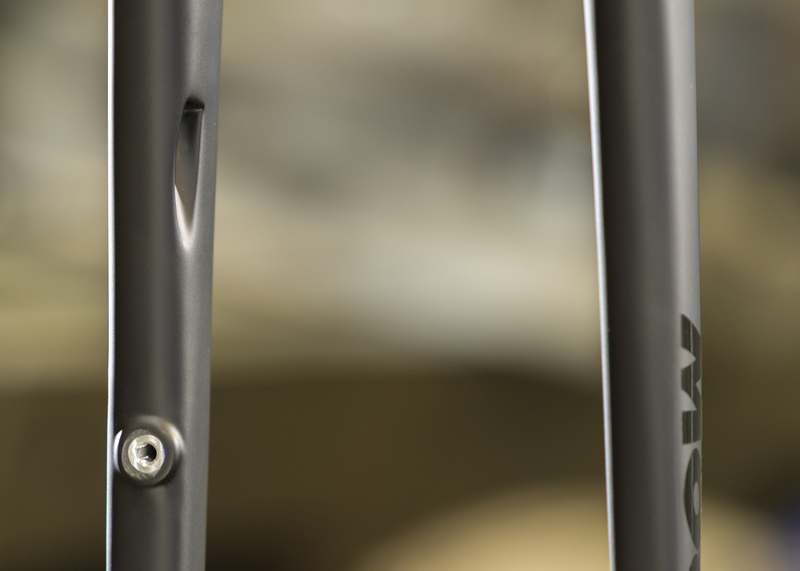 Tapered from 1.25 to 1.125 to work seamlessly with our 44mm head tubes and handle rider input without compromise. 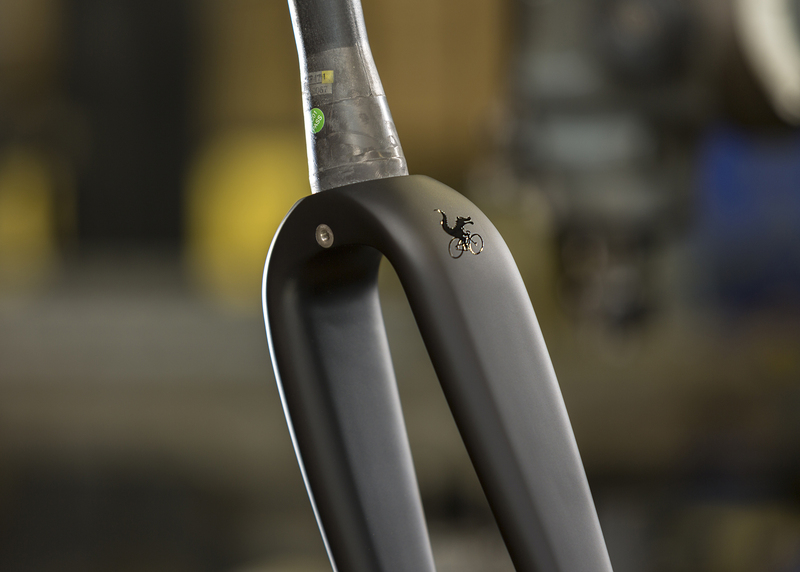 Using a 370 axle to crown length, 43mm and 50mm rake options, this fork pairs perfectly with our disc road geometry to offer perfect handling and stability. 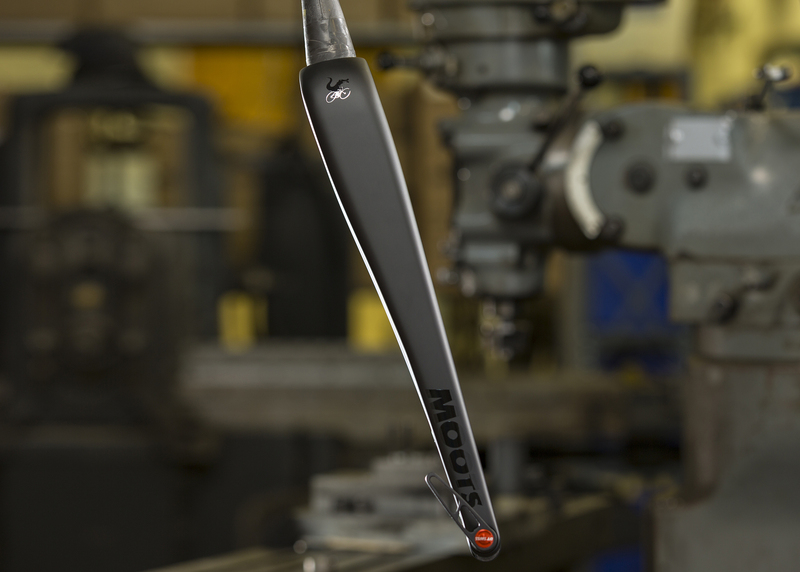 The fork can hold up to a 30mm tire. Flat mount disc brake mount, 12 x 100 thru axle for precise hub and rotor alignment. Internal hose routing for clean aesthetics. 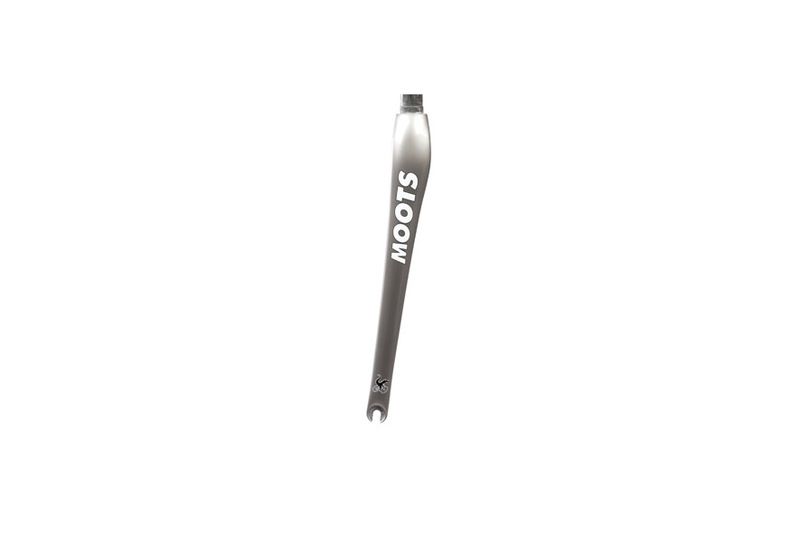 Max rotor size: 160mm Fork weight: 440 grams with axle. 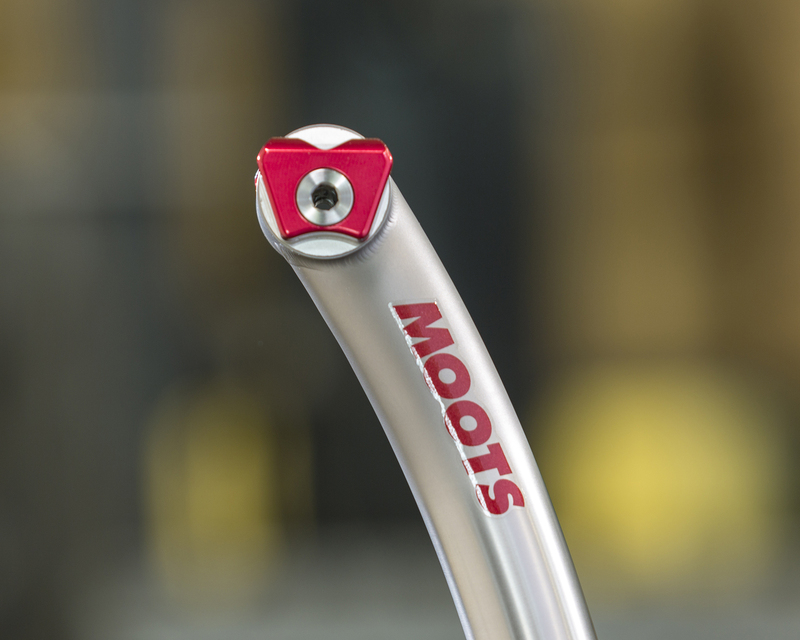 The all purpose Moots Road Fork is available in 50, 45 and 40mm rakes. 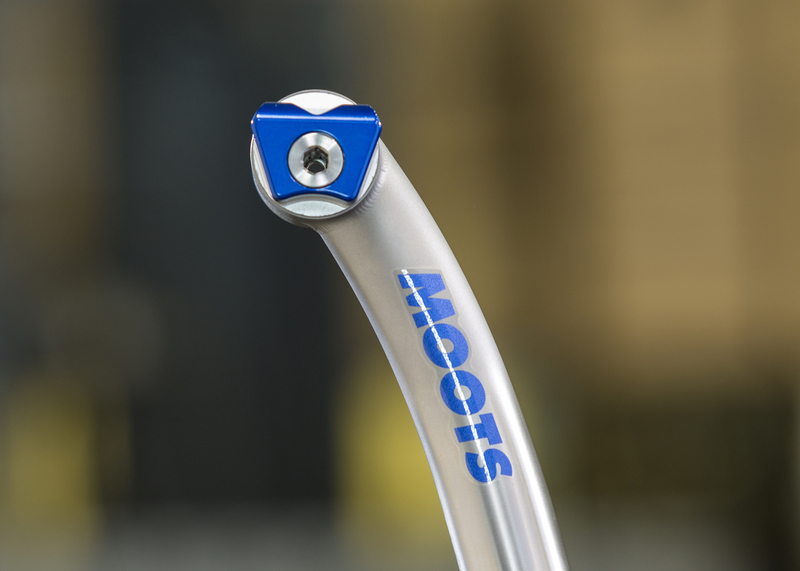 The approximately 330 gram road fork is designed to work with the Vamoots and Vamoots CR frames, offering lightweight and stable handling over the roughest of roads. Top cap and expander plug are included. This fork has clearance for a maximum 28c tire. 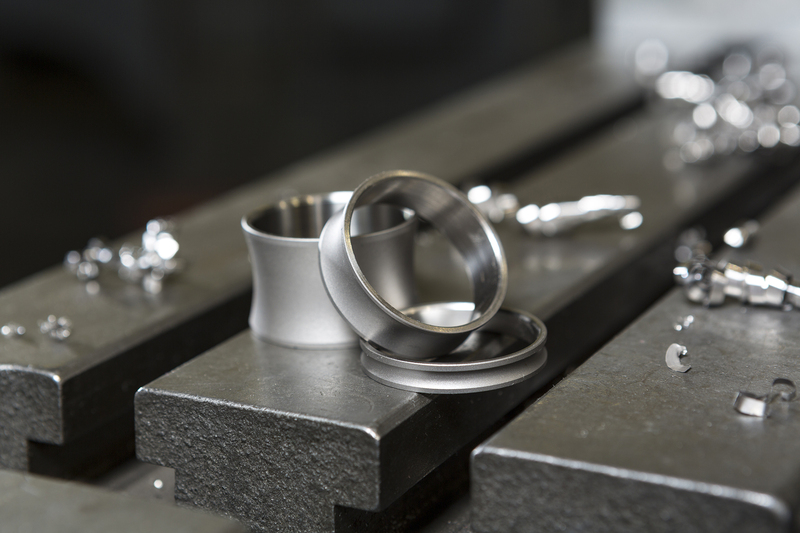 A high-end component should be durable, beautiful and especially user friendly. 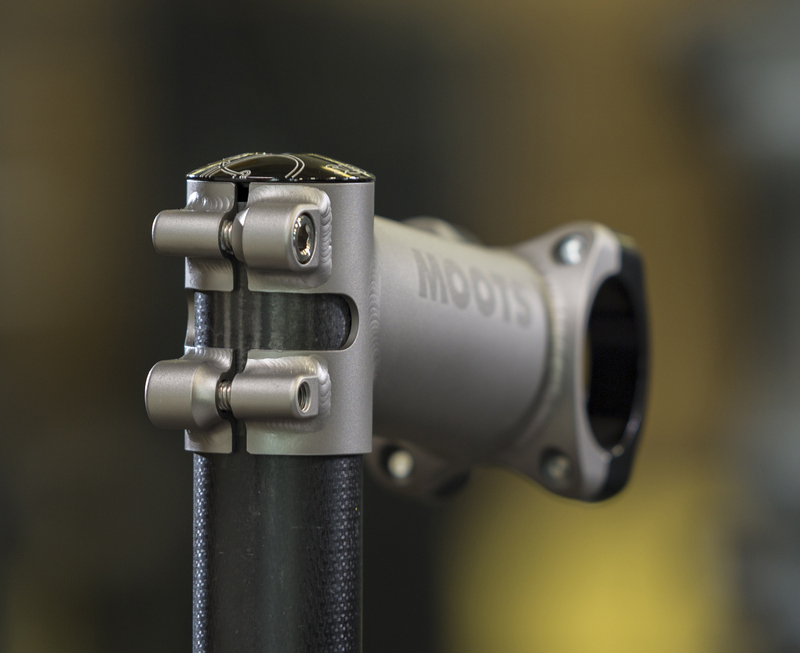 Enter the Cinch Post —a culmination of nearly 20 years of experience building titanium seat posts, and the mission to design the perfect post—easy to use, durable & extremely light. 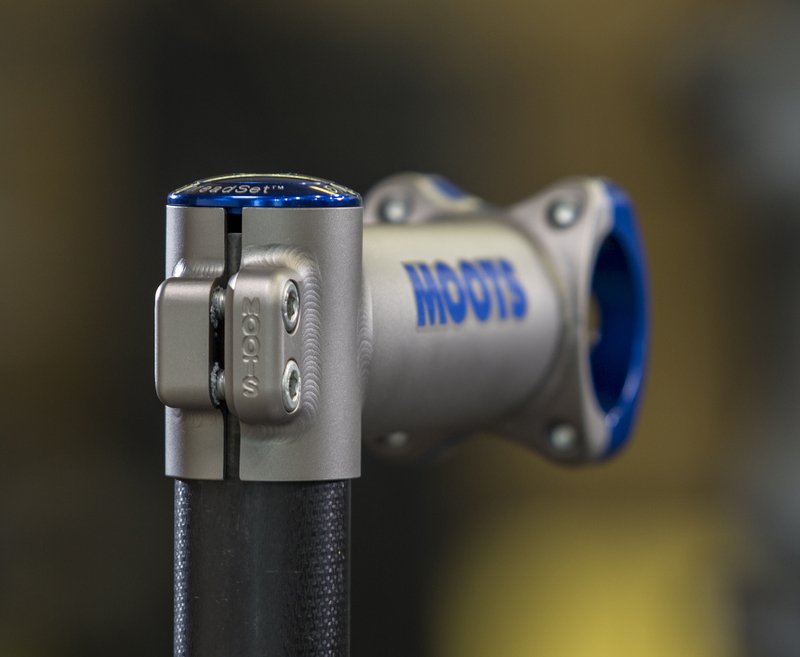 The Cinch Post has the benefit of dual adjustment; two outer plates hold the post in the fore/aft adjustment—without affecting the (third) internal 5mm bolt, which easily adjusts tilt. Available in a straight or laid-back option, it comes in two diameters (27.2 and 30.9), and three different lengths (280mm, 340mm and 380mm). *Please note: the Cinch Post is only compatible with 7mm round rails. 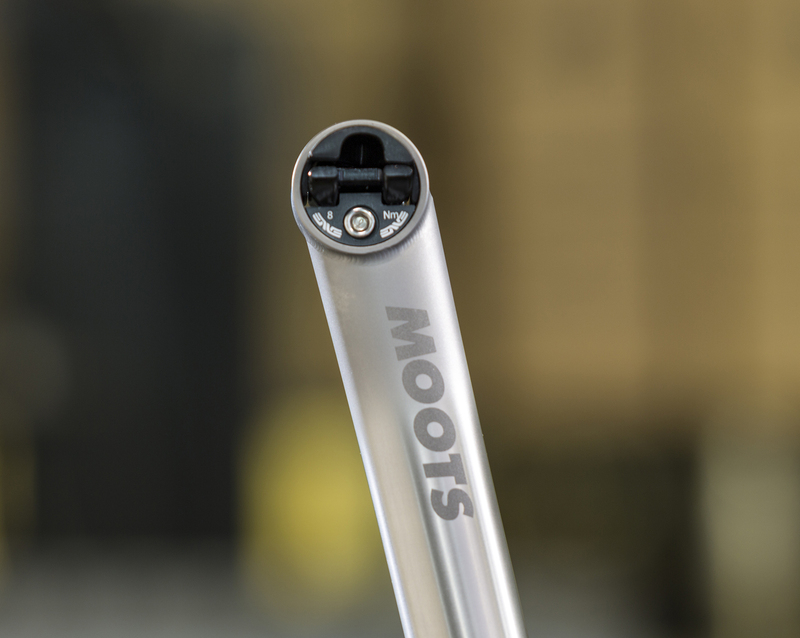 NEW for 2018 is the option to order a Moots seat post that holds the Enve internals for a cabon railed saddle. Note: The Enve internals will not work with the standard Cinch Post, it must be made with a specific head to accomodate the Enve internals. 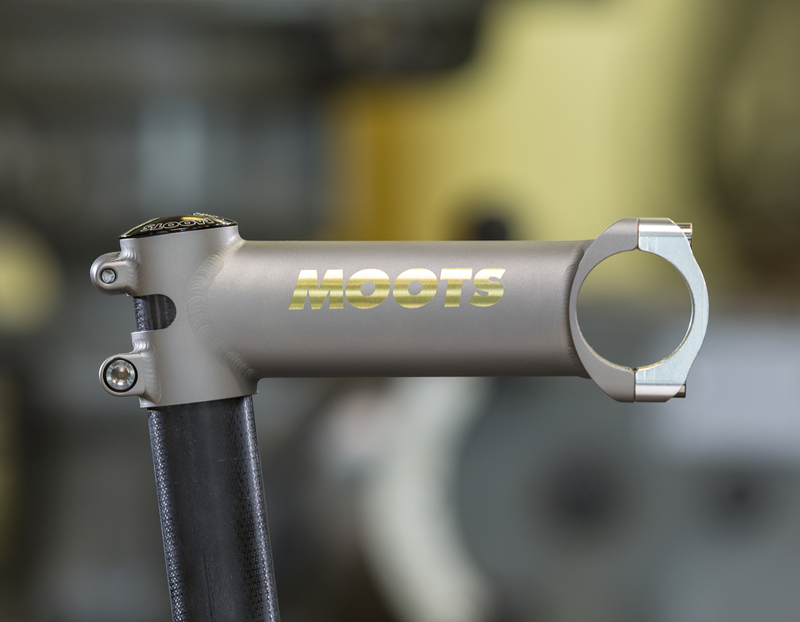 We offer color coordinated anodized parts to match your Moots frame decal choice and your personal tastes. 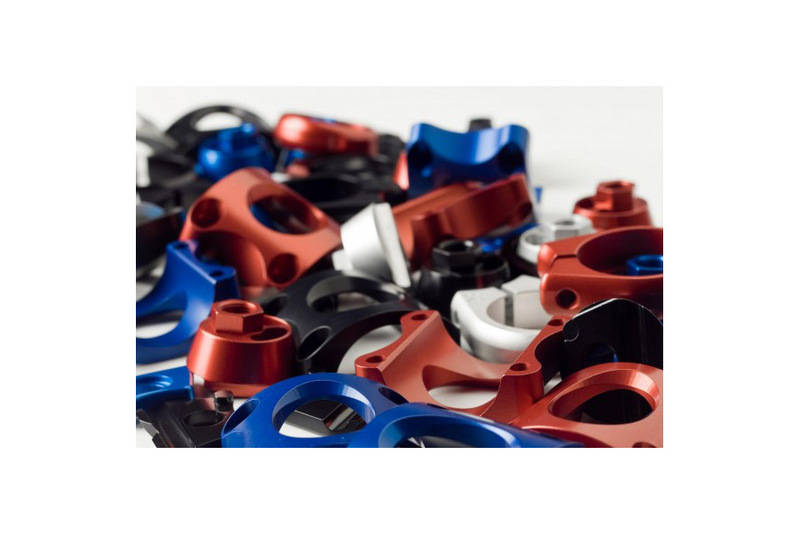 The packages include face plates, Cinch post side plates and mountain bike seat collars. We offer blue, red, or black. *All decals and parts colors attempt to match the standard Chris King colors. 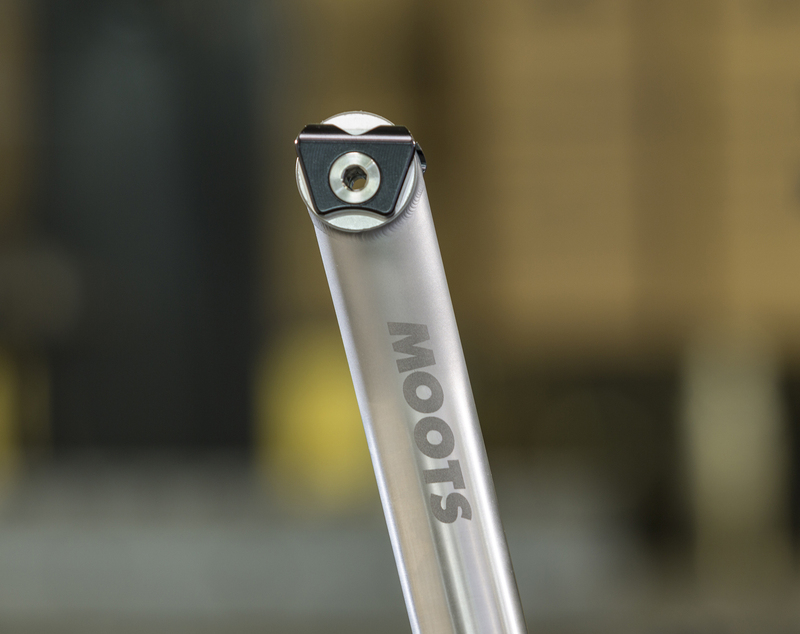 However, due to alloy differences on Moots parts and the nature of the anodizing process, all colors may not perfectly match. 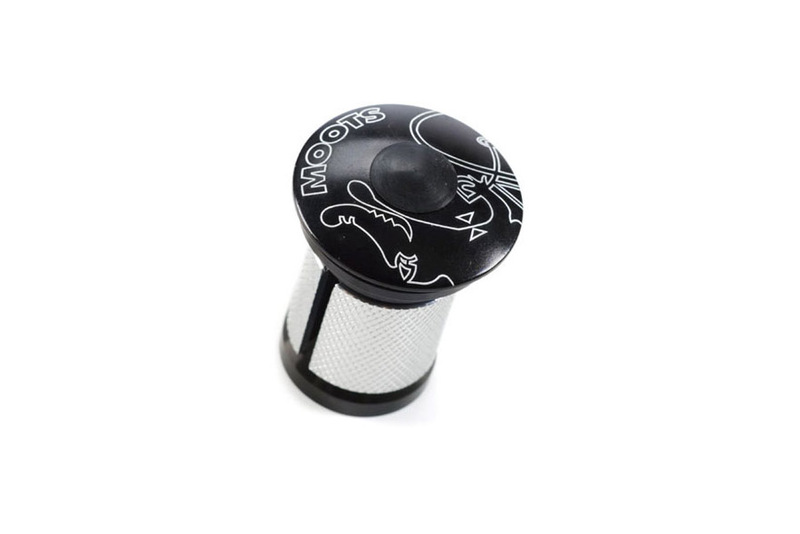 In addition to our clean and seamless standard spacer, we now offer a new RSL spacer. 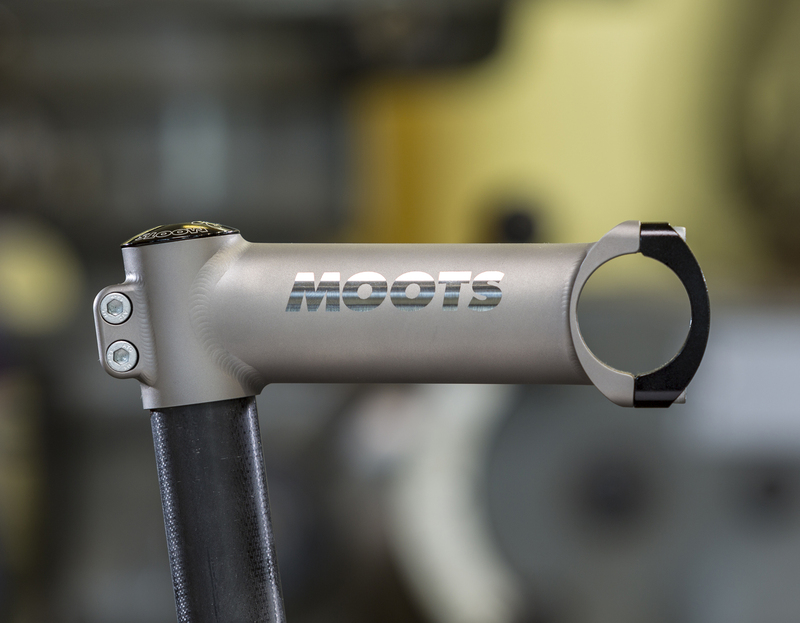 Machined in-house, the RSL spacers offer a simple curved radius to give a much overlooked area of a bike a nice flow from Moots stem to headset top cap. 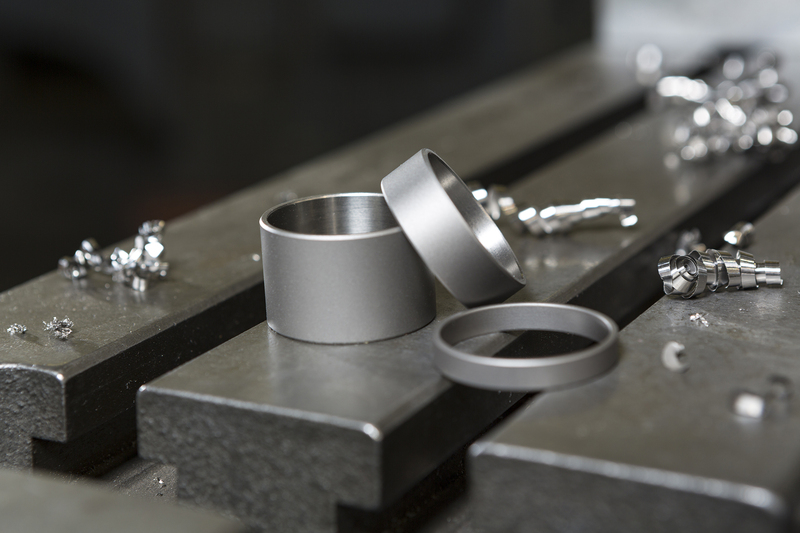 These 1 1/8” diameter spacers come in 5mm, 10mm and 20mm increments. Custom always available. We’ve been building high-performance bike frames since 1981. 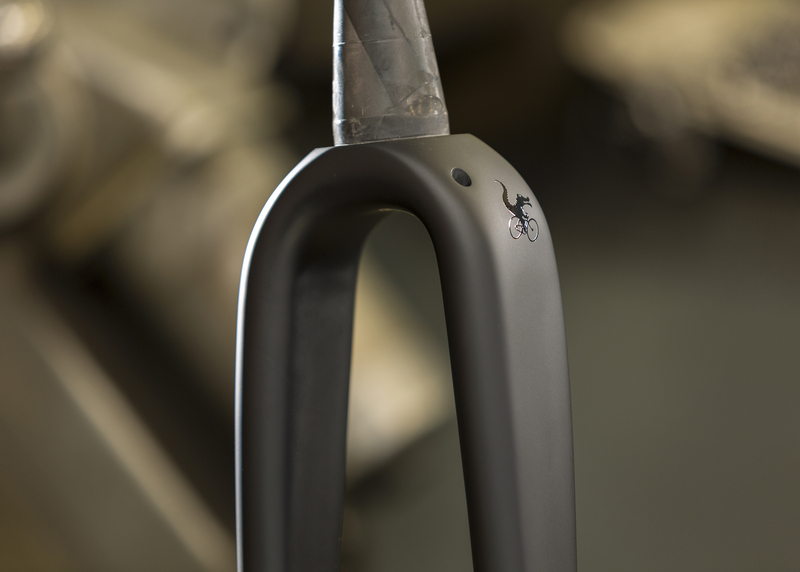 Each is meticulously fashioned out of premium US-made titanium tubing, allowing us to design every bike to the specific needs of the frame style and individual rider.